Flow Mania. In this colorful puzzle game your task is to connect pairs of dots to create a flow between them. All fields need to be covered with pipes, they cannot overlap or cross each other though. Can you complete all 150 levels with the least number of moves possible? This game can be played on all devices. Enjoy and have fun in playing this free online game on Round Games. 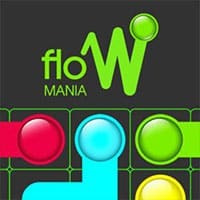 Flow Mania is a free online puzzle game on Round Games.